Barilla doesn't like LGBT gay people: who cares? Barilla’s Chairman Doesn’t Like Gay People—So What? 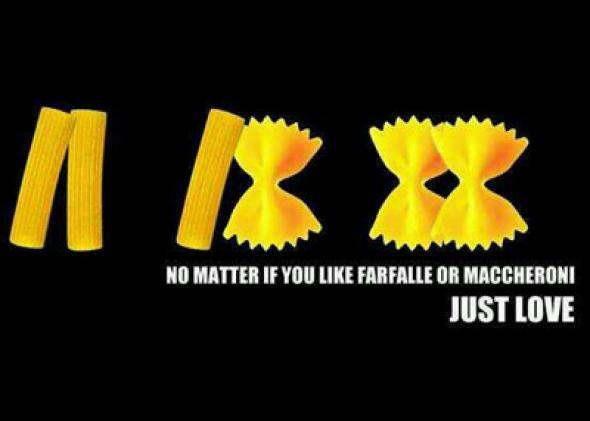 Have you seen this silly image of same- and opposite-shape pasta couples in your social feeds yet? While it may look like a juvenile parody of LGBT acceptance messaging, it’s actually a half-serious response to the outrage-news-of-the-day that Guido Barilla, chairman of so-so pasta manufacturer Barilla, doesn’t have much of a taste for gay people. According to a Reuters translation of an Italian radio interview, Barilla said that he “would never do (a commercial) with a homosexual family, not for lack of respect but because we don’t agree with them. Ours is a classic family where the woman plays a fundamental role.” He added matter-of-factly that if gay people “like our pasta and our advertising, they’ll eat our pasta, if they don’t like it then they will not eat it and they will eat another brand.” Another translation of the interview quoted Barilla as saying “I have no respect for adoption by gay families because this concerns a person who is not able to choose.” To summarize, the image of a gay family in a gay Tuscan villa making a steaming pot of gay carbonara just doesn’t have synergy with the Barilla brand. Understandably, LGBT advocacy groups in Italy and around the world have taken the statements—especially that quote about the availability of other brands—as a provocation and are calling for a boycott of Barilla products. Which is fair—as Barilla himself points out, consumers have choices in these matters, and if you feel moved to politicize your carbs on behalf of LGBT people because Barilla ads are hokey and old-fashioned, be my guest. But I would like to take a moment to reflect upon how troubling this and other recent dust-ups regarding some giant corporation’s “feelings” about the gays really are on closer inspection. I’m by no means the first person to say this, but being offended (or for that matter, flattered) by an entity whose sole purpose is to sell things, maybe to you or maybe to someone else, is to unavoidably endorse and enliven the insidious concept of corporate personhood. Barilla is not your enemy and Absolut is not your friend; they are just businesses with PR departments that are at different points along the road toward realizing that influential, “taste-maker” minority groups are worth courting, both for direct patronage and easy image-boost-by-association. It’s unfortunate, I guess, that Barilla (or at least Guido Barilla) is behind the times on this matter, but the earnest anger I’m seeing online about that fact is perplexing. I mean, are you really so starved for approval that you need it to come packaged with pasta? I realize that the previous paragraph probably makes me sound like an Occupy Wall Street, anti-capitalism type, which is really not the case. My concern with this increasingly common “the gays are for/against X corporation” trope is far more basic than that: I simply resent being told I should change my shopping list every time some old C-suite dude runs his out-of-touch mouth or offers to sponsor my next parade. Show me a company that’s actively hurting gay people, and then we can talk seriously about boycotts and the rest; but if the issue is merely some disagreement over what a family looks like or whether Guido wants to cast us in his lame commercials, let’s not give him the energy or publicity. For one thing, it’s a waste of time that can only lead to a fake apology at best. But more important, getting riled up about the inane statements of a random businessman is really a kind of activism in support of the corporation’s increasing power in our society. And that’s something I just can’t stomach.